Our Service Coverage Area includes Wilton, Rancho Cordova (south of White Rock Rd. ), rural Elk Grove, Flag City, rural Lodi, Galt, rural Clarksburg, Camanche, and Hood. 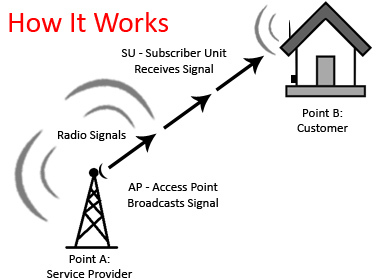 Our wireless Internet servcie is distributed to homes and businesses through radio transmission. It is necessary to have a clear line-of-sight from one of our broadcast access points to your location, in order to reach you with our Internet service. NOT ALL PLACES in our Service Coverage Area will have a clear line-of-sight from one of our towers, because of trees, buildings, hills, and other objects which may block our signal. If you are interested in receiving our Broadband Internet service, please phone our office at 916-685-3200 and provide your street address. This will enable us to make a preliminary evaluation of whether your location is reachable from one of our broadcast access points.